Here's gremlin's First Look at the upcoming sci-fi adventure, Prominence. A solar prominence is a stunning sight in astronomical imagery; an eruption of amazingly hot material from the surface of the Sun. One would assume, the laws of physics being constant across the observable universe, that such events also take place on other stars. So knowing all this, I was already suspicious of what the situation was going to be in a game of the same name: Prominence. 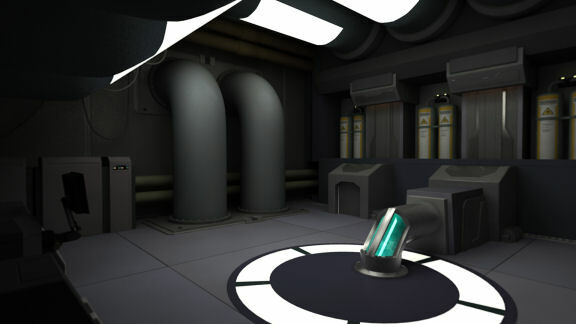 Prominence is a point and click adventure game in a first person perspective. It's a while since I've come across one of those where the locations are 360 degree bubbles, but that's what the developers have chosen for this one. However, in contrast with older games in this style, the locations are rendered in high resolution, and they're generally closer together than before too. It didn't take long for me to forget about the bubbles and think of them as stepping stones instead. The story of Prominence begins with an explanation that you're part of a Letarri mission to establish a colony on a new world. However, the game begins when you wake up, seemingly alone, in the medical bay of high tech, futuristic space base, but the lights are dim, and things aren't working well. As every good sci-fi geek knows, the first priority in any high tech disaster zone is to get power, life support and communications up and running. That's certainly the way I approached the beginning of the game. Whilst trying to avoid spoiling what happens, once the base's systems are in better condition, the game interface gets some interesting additions. To put it simply, Google Glass has nothing on what the Letarri can do with their computers! The look of Prominence sticks quite closely to the smooth lines and holographic graphic aesthetic of the Star Trek family of science fiction. We're not in the Wild West of space (like Firefly) or a slightly Steam-Punkish Mid West (like Star Wars). However, not everything can be fixed by asking the computer to do it for you. There's real work to be done. The puzzles in the early part of the game include inventory puzzles, and logic puzzles. This game is about more than 'find key card A' and 'get the spanner from B'. You need to pay attention to how things work, and think ahead. Having said that you're alone in the beginning of the game does not tell the whole story of course, and though I've not played more than a few hours of Prominence, there are other voices in the story. First of all, this First Look is based upon a pre-release, press demo, which came with notes on how the game will contain more interactive content, as well as telling a much longer story. However, the content I did see left me in no doubt that Prominence will be a very intriguing game, and I hope there will be more twists and surprises along the lines of those in this demo. (Oh how I want to say more about those, but I won't). Finally, I have to say, I'm looking forward to the eventual release of Prominence; it's a very promising game. Great First Look! Thanks Gremlin and Jenny. But what are "360 degree bubbles" I have never heard this terminology used before? The "360 degree bubbles" method is where you don't have full movement in the environment, but you have locations at which you can look all around, including up and down. I suppose it's the half way house between the fixed views of Myst and the full motion of realMyst. Thanks Jenny and gremlin. Sounds and looks like a great game! Thanks for the explanation Gremlin. I still couldn't picture in my head exactly what the 360 degree bubble looked like so I took a look as this in game video...is this what you mean? Yes, that's the right game, and it does show what I described. Basically, when you click to walk in a direction, it is not up to you how far you walk, you automatically walk to the next 'bubble'. I wish you had said more because the in-game footage is about as interesting as watching paint dry to me, gremlin. I'll admit I'm not one for having no one to talk to but Hal, or solitary exploration, and figuring out logic puzzles a la Myst, though I realize plenty of people love games like that. Is that what this is? This is a First Look from a game that is not a finished and/or polished. It is even a pre-demo so it's a rough and possibly short peek of the game only. Let's see if the game hold to the same thoughts when a complete game is played. Let's see from gremlin if he had any other interaction with another character aside from "wake up seemingly alone". Nicely written, gremlin. And based on the footage that GreyFuss shared, I can see what you're talking about. The movement felt smooth--as if I'd just naturally taken a couple of steps and then stopped to look around. The integrated sound of walking helped, I think. I didn't feel as though I'd been flung down the hallway after one step! And the panning views weren't jerky or spinning. The graphics looked great too, in the video and the pics you gave us. It has a feel of another game I've played. Can't think now which one ... ?? Thanks gremlin, GreyFuss, and Jenny100. I have been waiting for this game for YEARS . I 'm so anxious to 'go there' and experience it. Please, let it be soon. As Mag mentioned, my comments are based upon a very pre-release demo that covers perhaps the first couple of hours of the game. I didn't want to comment too much upon the couple of surprises that come in that time because they would definitely be spoilers. 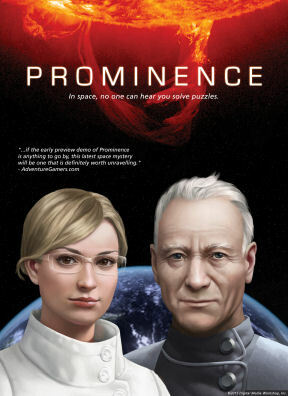 As far as I can tell (but I may be wrong), Prominence won't feature long and complex dialogue trees (as were found in your favourite game, from the looks of your location and signature ;)), but does contain mechanical and computer-based logic puzzles. If that's not your thing, walk on by. There seems to be quite a bit of anticipation about Prominence, which is always encouraging with an indie production. I think we should leave the developers to finish their work before judging any further. Thanks for the preview, Gameboomers! That's correct. There are no dialog trees in Prominence. However, there are more than two dozen characters in the story, and most have quite a bit to say via voice and/or text (depending on how you set the in-game options ). So despite a lack of dialog trees, we still try to have characters who bring some of the triumphs, tragedies, comedy, and drama of the story. The player also uses the various character dialogs and texts to help unravel key events in the story, and sometimes to help solve puzzles. Thanks for the input cg_mike. From your avatar, I'm going to guess that you're involved in Prominence, if so, excellent work, keep it up. Glad to help! I've added a sig now. Thanks for the kind words. I checked out the "in game footage" and it looks fantastic! This is my kind of exploring game! I can't wait for this one to be completed. It's looking likes a true exploring adventure game! You've got my vote Mike M.! I have also played this demo game. The full game when it is released will consist of 4 acts. The demo only consists of 2 acts. Within the first 2 acts, the game is still only partially functional. In the final release, there will be quite a few additions to the pre-release. The game as mentioned by Jenny is slow to begin where the medical Bay is dimly lit due to low power. After restoring power and you can see clearly where you are going,more things are revealed. The game evolves logically and methodically. Without revealing any spoilers, you will be surprised who you are when you meet ANNIE, the central computer. The puzzles are logical and are well integrated into the game. They are not contrived in that a puzzle is placed for the sake of having a puzzle to solve. I can only assume that there are survivors somewhere else in the space vessel. You can find out from several communication points after power is restored and you solve a couple of necessary problems, who some of the crew members are and their titles. The graphics are really great and I am sure most players will love this game. Hats off to Mike Morrison and his team in developing this amazing game.